SAN FRANCISCO (KGO) -- It's an incredible time for sports fans in the Bay Area with two championship trophies on the line in the next few days. The Golden State Warriors are one game away from the franchise's third NBA championship and the San Jose Sharks are fighting back to win their first. The Warriors are now back in the Bay Area after getting a huge Game 4 win in Cleveland Friday. The team plane arrived at Oakland International around 4 a.m. Saturday. The Cleveland Cavaliers are back in the Bay Area as well. Every time the Cavaliers file into the Four Seasons before each game there is a crowd of fans to greet them. Today was no different. Dozens of people gathered to see the team walk into their hotel off Market Street, many of them Golden State Warriors fans. There is no doubt the Cavaliers are a team to be respected. And Lebron James got some extra cheers from fans when he arrived at the hotel. The Warriors are up 3-1 in the NBA Finals. If the Warriors win Monday it's all over and they become back- to-back NBA world champions. At the moment there are two professional league championship trophies being played over. 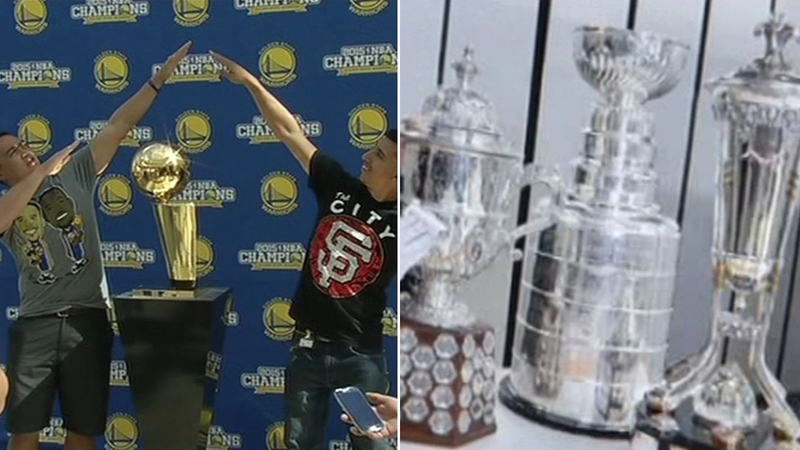 In addition to the NBA trophy, the National Hockey League's Stanley Cup is also in the Bay Area. Depending how the next couple days play out - those trophies could be handed out in succession. It's nearly unheard of for back to back championship games in two different leagues to be scheduled in the same market. The last time it happened was back 2003 when the New Jersey Devils won the Stanley cup and the New Jersey Nets lost the NBA Finals in New Jersey. ABC7 is your home for the NBA Finals. Game 5 between the Cavs and Dubs in Oakland starts at 6 p.m. Monday, only on ABC7. For full coverage on the Warriors, click here. And we want to see your fan photos and videos! Tag them on Twitter, Instagram, or Facebook with #DubsOn7 and we may show them online or on TV!